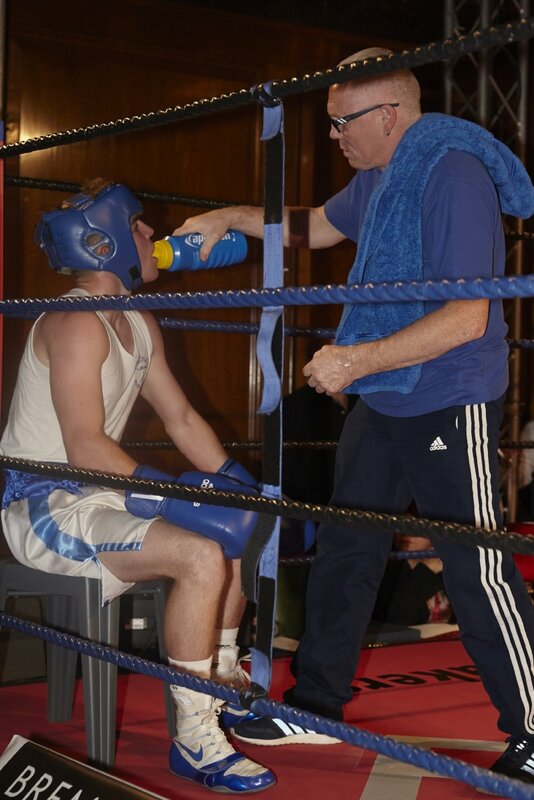 Battles of London was very proud to support Fitzdares Fighting Futures, an evening of top-flight amateur boxing at The Ned featuring London’s most venerable gyms. Watching BT Sport or Sky, you could be forgiven for thinking that you pay a monthly stipend just to watch bookies’ TV ads. Rarely do you see a gambling house genuinely put something back into the games they indirectly profit from. Invitation-only bookmakers Fitzdares, who favour a personal , lo-fi approach to placing bets, are different. Its latest initiative – showcasing amateur boxing from London’s historic gyms at the city’s most salubrious new venue. The Ned, Soho House Group of hotels and members’ clubs venture into the City of London, provided an opulent backdrop for authentic grassroots combat sport. Four bouts announced by star analyst Steve Bunce gave top amateur boxers a chance to compete in an electric atmosphere, in front of a glamorous and highly engaged audience. The fighters walked to the ring in Battles of London’s new ‘Dempsey’ T-shirts (which of course they were given to keep), while Bremont watches sponsored the well-received event. Gyms represented included the famous Fitzroy Lodge, Finchley ABC where heavyweight star Anthony Joshua made his name, Lewsey Boxing Club in Luton, Lynn Boxing in Camberwell and Dale Youth, previously situated in the Grenfell Tower site. Enjoy our photos of the evening by Andrew Jackson. ...and Boxer of the Night honours went to Tosin Olalekan, a graduate of Mark Reigate and George Turner's respected Carney's Community program working with young men in need of guidance – or formerly, in Tosin's case. Battles of London extends its profuse thanks to the competitors, the gyms, plus Fitzdares’ Balthazar Fabricius and Harry Collins, and projects* agency's Justin Quirk.